MPG-o-Matic 2010 Mazda3 Review Summary: The 2010 Mazda3 is a blast to drive and can be more frugal at the pump than one might be lead to believe. As one of the best handling front-wheel-drive compacts on the market today, this affordably-priced sport sedan offers a brilliant alternative to a hum-drum life. Scoff at the big grinning grille and Zoom-Zoom tag line if you must. Once you drive one, you’ll understand. The front-wheel-drive 2010 Mazda3 is available as both a four-door sedan and a five-door hatch, with a range of trim levels. Two inline four-cylinder engines are offered: a 2.0 liter that produces 148 horsepower (HP) and 135 foot pounds of torque and a 2.5-liter (new for 2010) that produces 167 HP and 168 foot pounds of torque. The 2.0-liter engine can be mated to a 5-speed manual, while the 2.5-liter engine is available with a 6-speed manual. Both engines are offered with a 5-speed automatic. The front-wheel-drive 2010 Mazda3 is available as both a four-door sedan and a five-door hatch, with a range of trim levels. Two inline four-cylinder engines are offered, a 2.0-liter and a 2.5-liter. We tested an automatic-equipped s Sport sedan with the 2.5-liter engine, producing 167 HP and 168 foot pounds of torque. The official fuel economy estimates for the 2.5-liter Mazda3 are 21 city / 29 highway with the manual and 22 / 29 with the automatic. The 2.0-liter equipped Mazda3 is a bit more economical, with estimates of 25 city / 33 highway with the manual and 24 / 33 with the automatic. We rolled up more than 500 miles in our 2.5-liter automatic-equipped Crystal White Pearl s Sport sedan review unit and flew past the official mileage estimates, scoring an average of 34.6 MPG on the Interstate highway and 28.8 MPG combined in mild spring weather, with temperatures ranging from the mid-forties through the low-seventies. Interstate highway testing temperatures were in the mid-sixties. The test vehicle was equipped with the standard 17-inch alloy wheels, clad with Yokohama Avid S34 205/50/R17 all-season tires, and was delivered with under 1000 miles on the odometer. 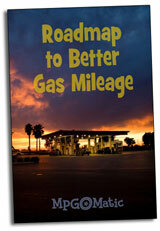 The 2.5-liter engine provides a satisfying level of performance on regular unleaded gasoline. The center-mounted Multi-Information display provides trip meters, range to empty, average fuel consumption, and real-time fuel economy displays. As always, we recommend driving with the real time MPG display active to encourage a light-footed driving style. If you enjoy spirited driving, the Mazda3 is sure to bring a grin to your face. This is one of the best handling affordably-priced front-wheel-drive compacts on the market today. All 2010 Mazda3 models are equipped with four-wheel power-assisted disc brakes. The s Sport and S Grand Touring feature slightly larger discs (11.8-inch vented front/11-inch solid rear) than the i SV, Sport, and Touring models (10.9-inch vented front/10.4-inch solid rear). While purists will opt for the manual transmission, the Sport automatic provides a manual-shift mode, with control over gear changes via slapstick. The s Sport sedan includes Bluetooth, a leather-wrapped steering wheel (with integrated controls), “Electroluminescent gauges with red & blue nighttime illumination” and cloth seats as standard equipment. (Lesser models have white-on-black gauges, with simple red illumination). Leather seats (with five-level heating), and an 8-way power driver’s seat are only available in the top-of-the-line s Grand Touring model. Adjustable lumbar support is not available. Our test unit was equipped with the reasonably priced Moonroof/6 CD/10-speaker Bose option package. An audio input jack is standard. USB iPod support is optional (although our test unit was not equipped with the USB option). There are two twelve-volt outlets. While the Mazda3 sedan clearly benefits from its low 0.29 coefficient of drag (Cd), the rear seat remains comfortable for two. There’s a good amount of headroom, despite the car’s excellent aerodynamics. The sedan’s cargo area provides 11.8 cubic feet of storage with the 60/40 rear seats up and plenty of room to haul larger items when the rear seats are folded down. All-in-all, the 2010 Mazda3 is well-suited for enthusiastic drivers, whether on a budget or not. That big grin on the grille is just a hint of how you’ll feel after a quick run down your favorite twisty road … and when you roll up to the gas pump. Curb Weight: The four-door manual transmission-equipped 2010 Mazda3 s Sport Sedan weighs in at 2,963 pounds, while the automatic weighs in at 3,025 pounds. Looks like Mazda is on the right track. Glad to see smart people making smart decisions. How many passengers is this vehicle for? Excellent and very informal video!